This morning was a cool, quiet, overcast summer sunrise. There were highlights of pink in the mid atmosphere but the sun didnt make any kind of appearance. That’s OK though because sunrise 86 was enough of a show to last me over for awhile! I enjoyed the dark morning light and my morning coffee. Today’s actually a special day, too! It’s my birthday! Another year older, and I find myself even more glad that I started the Ault Park Sunrise project. It has been a great creative exercise for me and has also enabled me to explore the local history of my area and meet some great people. Indeed it has truly become a kind of journal for myself, something that I will look back on many birthdays from now with nostalgia and pride. I hope that the thought of this project conjures up feelings of mobility, freedom, and the passionate pursuit of personal exploration (both internal and external). 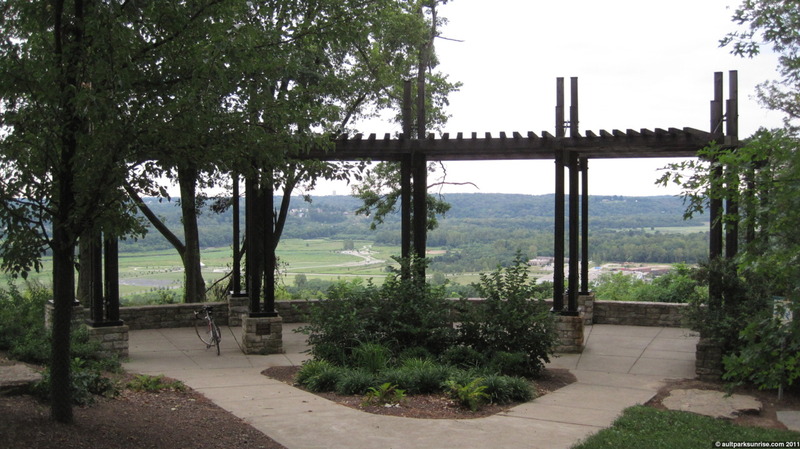 A zoomed-in view of Armleder Park. Tonight, even though it’s my birthday, I’m working late on my thesis software project. I brought along the “3-amigos” to join me while I listen to Frank Zappa’s Hot Rats and delve into the guts of RTCmix and PyEvolve. We visited friends up in Columbus, Ohio last weekend and on the way back I made a stop at the local carry out. I always try to pick up some beer that I can’t get down in Cincinnati. Typically this includes some Lagunitas (pictured right) or a local Columbus micro-brew. The store was actually out of Columbus Brewery’s India Pale Ale, and the guy behind the counter suggested Elevator Brewery‘s 3 Frogs IPA. I have been impressed with this beer as it shows elements of a well balanced classic IPA but I’ve only had one so far, so my opinion of it still needs time to develop. The middle beer is the “Double Dog Double Pale Ale” from Flying Dog Brewery. It clocks in at an impressive 11.5%, just barely under the max ceiling of 12%, a limit you can’t exceed if you wish to sell beer in Ohio. This was a birthday present from a friend of mine, a great present indeed! The third beer is Lagunitas’ Undercover Investigation Shut Down, one of my all time favorite brews from one of my favorite breweries. I’ve been bugging Lagunitas for months now to try and coerce them to sell their brews down in Cincinnati, but apparently there is some strange stale mate between the distributors in Ohio so for now I have to drive to Dayton or Columbus to snag ’em. Undercover Investigation Shutdown Ale is a healthy American Strong Ale that clocks in at almost 9.9% ABV and has the alluring crisp house flavor that I’ve come to appreciate in Lagunitas’ beers, resulting from their unique strain of brewer’s yeast. The history behind the Undercover Investigation Shutdown Ale is rich and hilarious, and you can check out the video here. Quality is kind of awful, but the audio is intact. 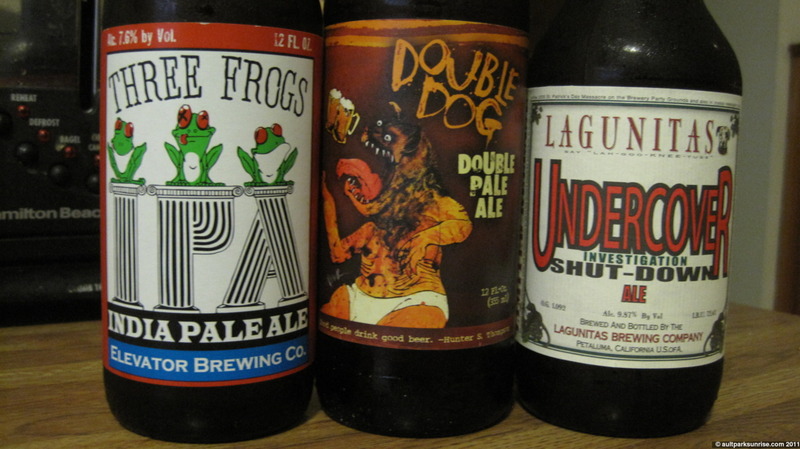 Interestingly enough, these three beers range from all sides of the country: west coast (Lagunitas), east coast (Flying Dog), and the midwest (Elevator). This entry was posted on August 24, 2011 by Ault Park Sunrise. 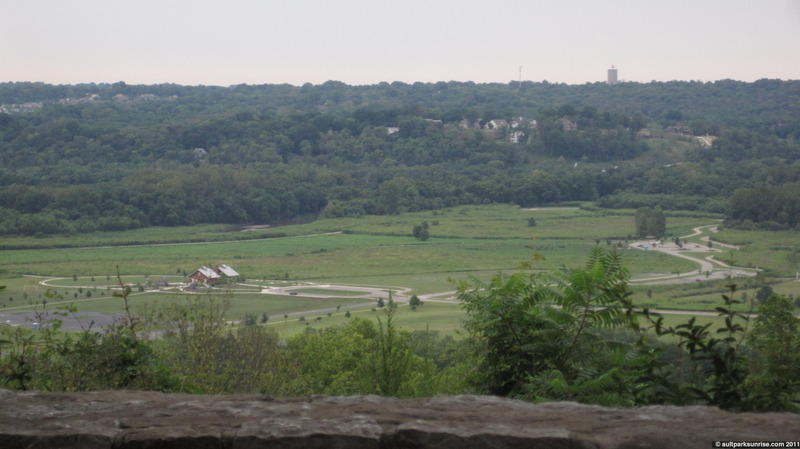 It was filed under ault park, overcast, sunrise and was tagged with ault park, beer, cincinnati, overcast.